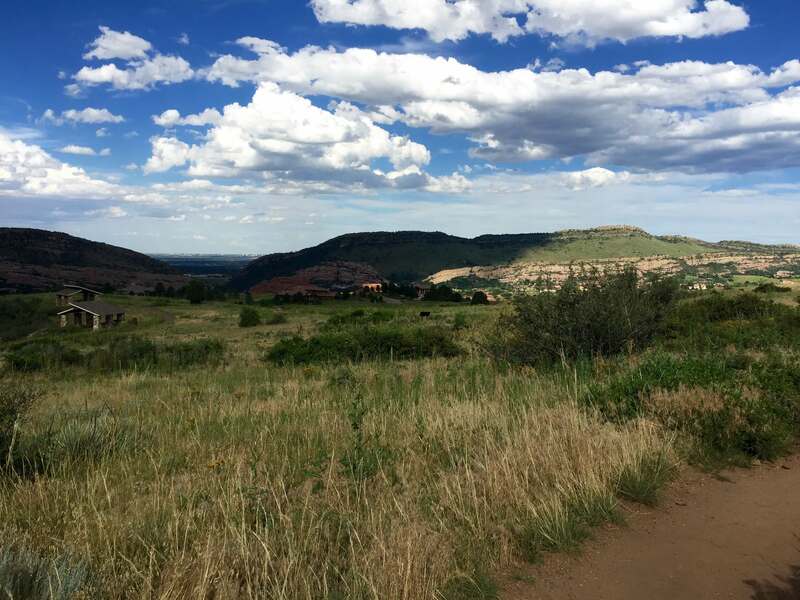 The next hike of the 2015 summer season brings us a little bit out of Roxborough and near the Deer Creek Mesa area. The drive is approximately 20 minutes but is definitely worth it as you’ll gain great views of downtown Denver. Heading north on Wadsworth Blvd, take a left onto Deer Creek Canyon Road just before the 470 ramp. Stay on Deer Creek Canyon Road for about 4 miles. Take a left onto Grizzly Drive and follow the road up till you reach the Deer Creek Canyon parking lot on your right hand side. There are plenty of parking spots and you may even see a couple horse trailers parked along the side. Before you leave the parking lot, make sure to use the restroom facilities and fill up water bottles if necessary as these are the only facilities in the park. The hiking trail described is a loop so you can start in either direction. For the purpose of this description, the trail was hiked clockwise – head left from the parking lot. You’ll start on Plymouth Creek Trail at a slow accent alongside the residential neighborhood of White Deer. Rattlesnakes are often spotted on the trail and this portion of the trail is popular amongst bikers and horses so be cognizant of this. The trail will get a bit steeper as you make your way through scrub oak and along the creek. The Plymouth Creek Trail will run into Meadowlark Trail after 1.1 miles. You’ll come to a small bridge on your righthand side. There will also be a sign indicating the Meadowlark Trail. The Meadowlark Trail continues to climb up the side of the mountain where you’ll see some incredible views of downtown Denver. The trail levels out for a bit before it begins to descend. During this time hikers will walk through more scrub oak and wild flowers are prevalent along the sides of the trail. Lockheed Martin comes into view as the trail wraps around the mountain on the descent. The trail enters into several switchbacks before hitting the remaining stretch. You might consider stopping at one of the picnic shelters for a snack before continuing on to the parking lot.